Daniel Schorr, 93, passed away this morning at Washington Hospital Center. Schorr has been one, if not the, most senior reporting journalists in the United States. His career dates back to the 1950s, when he reopened the Moscow bureau of CBS News, and in 1963 he had the first foreign interview with Nikita Khruschev. He was on Richard Nixon’s list of enemies in the 1970s. 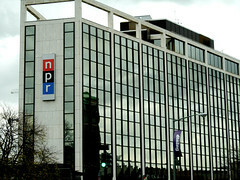 He went to work for NPR in the 1980s, and had not officially retired. I loved his voice and his demeanor. He was unafraid of telling you not just what happened (in excruciating and omnipotent detail), but what it meant. That sort of insight is largely absent from our modern blowhole media, where the cable news networks blather on without context or history. I will miss Daniel’s presence on my radio on Saturday mornings. Though Studio 2A at NPR is named in his honor, I would hope that NPR might do more to honor the legendary journalist, whose career should stand as monument to all who work in the space today, and in the future. Put his name on your front door, NPR. Remind yourself every day that you’re not Fox or MSNBC, and that you’re proud of that. Do that for yourselves, and for the memory of one of DC’s finest journalists.